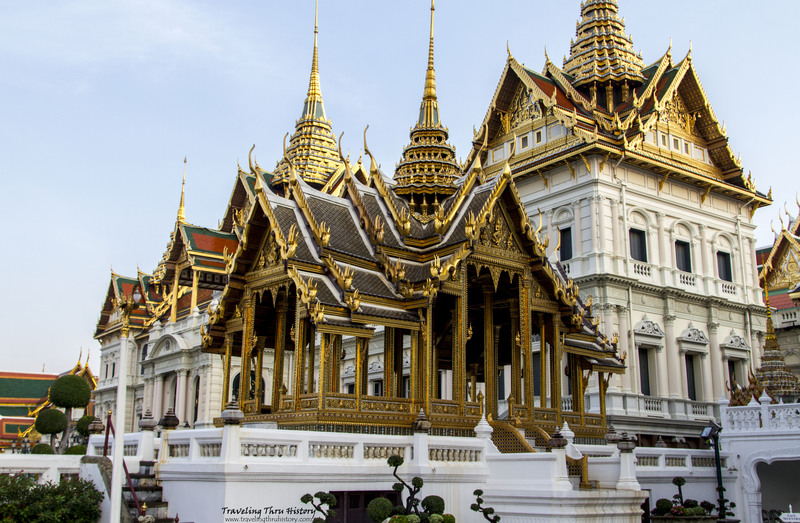 The Grand Palace of Bangkok is one of Thailand’s crowning jewels. It was the home of the country’s rulers from 1782 until 1925. 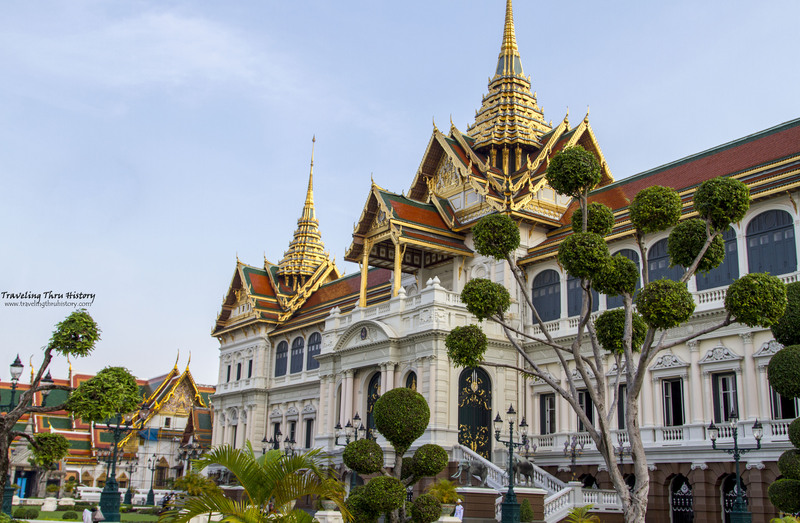 Once a fully functioning city within a city, the Grand Palace now used for various government offices, royal ceremonies, state functions and, of course, a tourist attraction. 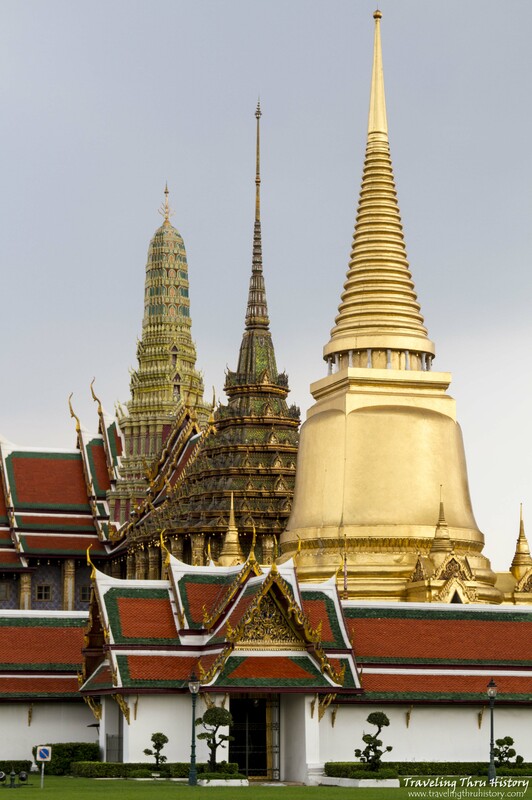 Construction on the Grand Palace began in 1782 and continued off and on until the late 1800s. 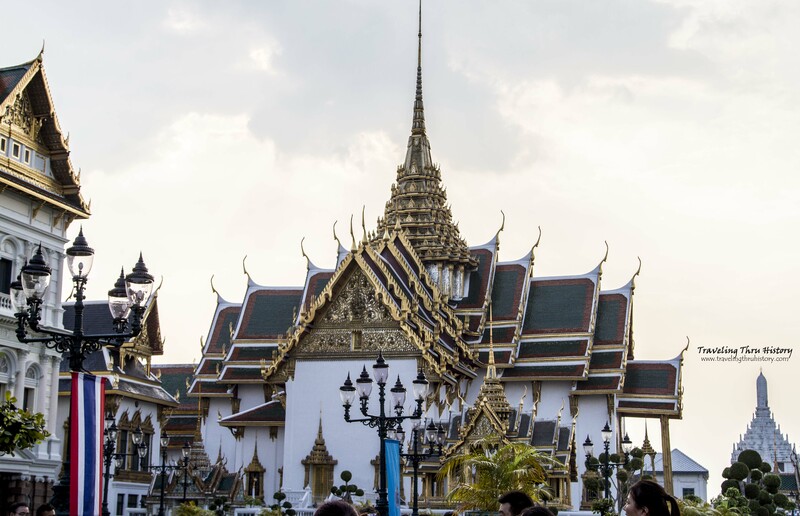 The original Grand Palace was hastily thrown together after General Chao Phraya Chakri staged a coup and took over the government from the previous king, King Taksin. King Taksin had resided in Thonburi, which is about 2.5 miles from the Grand Palace. When Rama I took over, he changed his name to King Buddha Yodfa Chulaloke (Rama I). 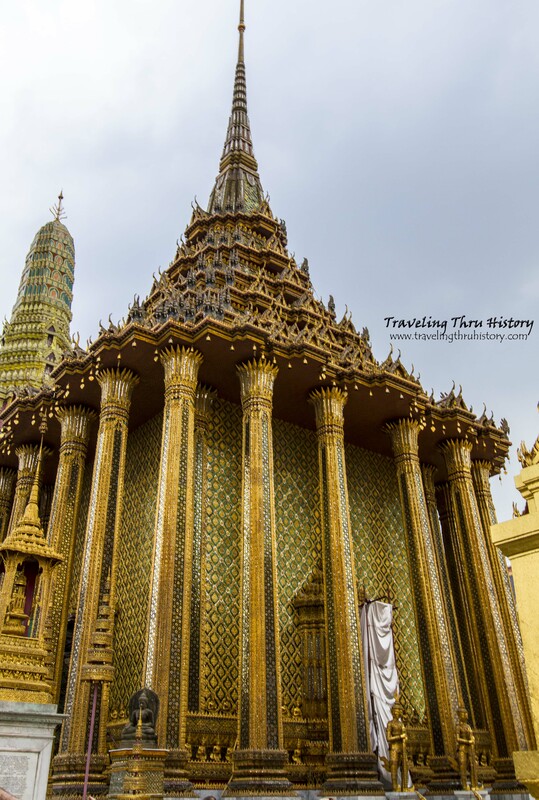 His desire was to create a new palace for his new dynasty, the Chakri Dynasty, and moved the royal court from the east side of the river to the west side. The old palace, a simple structure which had only been in use for about 15 years, then became a residence for various members of the Chakri Dynasty before being converted into a naval academy in 1900. The location of the Grand Palace was carefully chosen as one that was easily defensible, had room to expand and was in a beautiful location. Unfortunately, there were already residents living in the area where Rama I had chosen for his palace. That problem was easily solved by Rama I’s order for that Chinese community to remove themselves and relocate to outside the city walls. The area where those people moved to is now known as Yaowarat, or Chinatown. 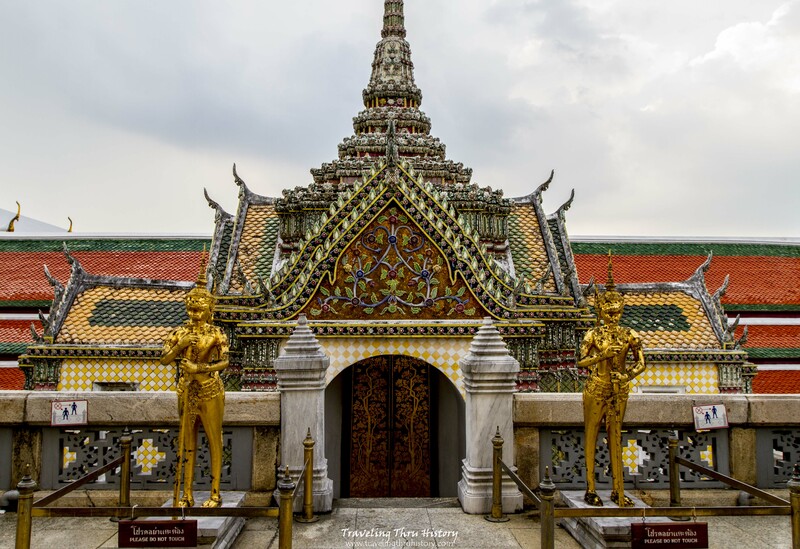 When the Grand Palace was first built, there were not sufficient funds to make anything grand or elaborate, so it was made solely of wood and completed in about 30 days. After the completion of the simplified palace, Rama I held a simple coronation ceremony to solidify his rule. He planned to hold off an a full-scale coronation celebration until he had a palace worthy of such an occasion. The original ‘palace’ was a simple complex comprised of a handful of wooden structures surrounded by a log fence. Over the next 200 years, various monarchs would upgrade, add and expand the buildings on that site to create the vast Grand Palace that we see today. In order to prepare for his grand coronation ceremony, Rama I needed to upgrade his palace. Since the treasury was pretty low on funds, he chose to begin his upgrades by scavanging materials from the ruins of the nearby Ayutthaya Kingdom. Over the next three years, Rama I’s workmen completely decimated the former Ayutthaya royal palaces and built up a new palace worthy of a King. In 1785, Rama I felt his palace was grand enough to host his coronation and held a full-scale coronation ceremony proclaiming himself the ruler of all Siam. 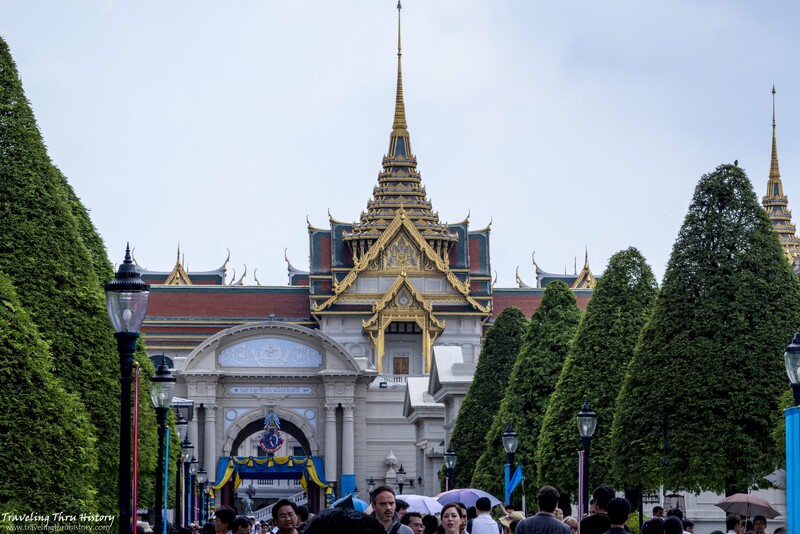 As it stands today, the Grand Palace is made up of four areas: the Outer Court, the Middle Court, the Inner Court and the Temple of the Emerald Buddha. Each of these areas is separated by walls and gates. The Outer Court is where the royal offices are located. The Middle Court was where the royal household lived and where the king’s ceremonial throne halls were located. The Inner Court was solely for the king’s wives and concubines and their all-female households. The Temple of the Emerald Buddha, as it sounds, is the temple that houses the revered Emerald Buddha. Unfortunately, not all of the palace grounds are open to visitors. There is an alleyway of shops, a few small museums and a lot of grounds. 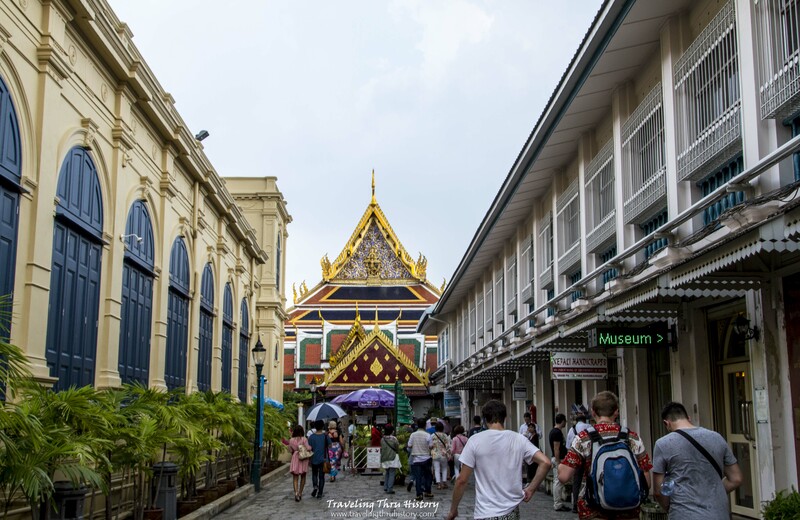 In the above picture, only one area is fully open for the public to roam: the group of buildings on the bottom left surrounded by a red gate (Temple of the Emerald Buddha Complex). Other than that, the public can go in the museums, which are buildings 32 and 35 at the bottom right, the outdoor area around building 31 and the grounds in front of building 26. Everything else is blocked off and guarded. When you first enter the palace grounds, you get a great view of the chedi, mondop and royal pantheon just beyond the wall. I was pretty excited when I saw those. They’re just beautiful. Disclaimer: This was my very first day of my first international trip and I was still learning to use my camera, so some of the pictures are less fabulous than I’d like them to have been. Phimanchaisri Gate, the main entrance from the Outer Court to the Middle Court. This is one of the most elaborate gates of the palace complex because this is where the king came in and went out during ceremonial processions. Alley leading to Gate No. 4, Hermit Gate: Entrance to the Temple of the Emerald Buddha Complex. There are various tiny shops and mini museums along the way. Where you’ll go through another gate (number 33 on the map) and then you will be inside the Temple of the Emerald Buddha Complex. Phra Phothi That Phiman behind the statue of the Seated Hermit, flanked by Ho Phra Ratcha Koramanuson and Ho Phra Ratcha Phongsanuson. This is just inside the entrance and on one side of the Temple of the Emerald Buddha. According to legend, this statue is said to be of the Hindu hermit who invented yoga. Behind the hermit is a consecrated tower holding a ringed chedi that Rama IV brought back from one of his journeys to the north. Phra Phothi That Phiman, flanked by Ho Phra Ratcha Koramanuson and Ho Phra Ratcha Phongsanuson. This is just inside the entrance and on the back side of the Temple of the Emerald Buddha. 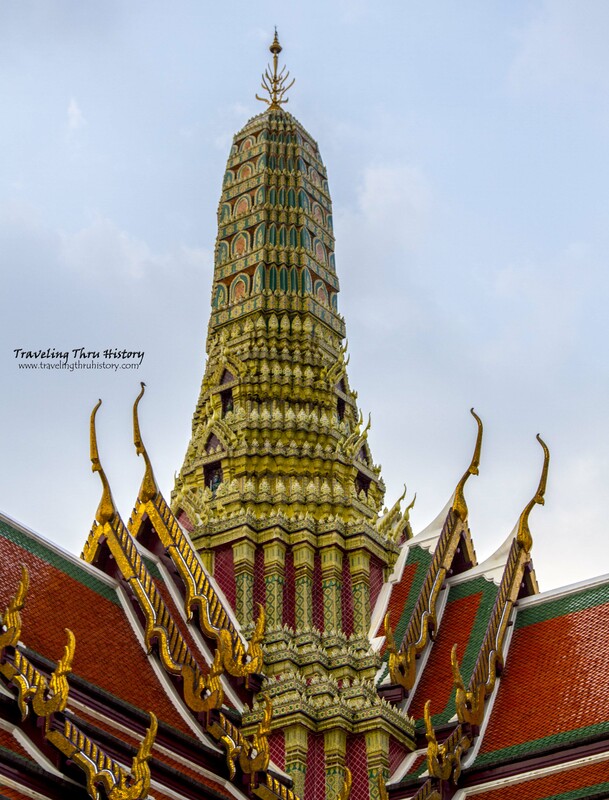 It is a consecrated tower holding a ringed chedi that Rama IV brought back from one of his journeys to the north. As you walk along the wall surrounding the temple complex, one of the fascinating things you’ll see is a mural. The murals tell the Thai version of the Ramayana, which is a Hindu epic that “depicts the duties of relationships, portraying ideal characters like the ideal father, the ideal servant, the ideal brother, the ideal wife, and the ideal king” (wikipedia). Click the images to see them bigger. Paintings in the galleries surrounding the Temple of the Emerald Buddha. They are from Ramakien, the Thai version of the Indian Ramayana. The next thing you’ll notice, or probably the first because they’re kinda hard to miss, are the giant 16.5 ft tall statues. Click the images to see them bigger and to see the names of each of the demons. Wirunhok, one of the Yaksa Tavarnbal (demon guardians) guarding the palace. He is the governor of Unthakarn City and is known to be irritable and quick-tempered. Maiyarap, one of the Yaksa Tavarnbal (demon guardians) guarding the palace He is the third king of water land and knows magical charms. Sahassa Decha, one of the Yaksa Tavarnbal (demon guardians) guarding the palace. He is the King of Pangtarn City, has 1,000 faces and 2,000 hands. The top of his baton can give life and bottom end can kill. Sahassa Decha (white) and Thosakan (alsko known as Ravana, green), two of the Yaksa Tavarnbal (demon guardians) guarding the palace. Sahassa Decha is the King of Pangtarn City, has 1,000 faces and 2,000 hands. The top of his baton can give life and bottom end can kill. Thosakan was known as Nonthuk in a previous life and was killed by Vishnu’s avatar, Rama. He has 10 faces and 20 hands. He is a demon who embodies every sin and emotion, thus making him the closest of all he demon warriors to humanity. 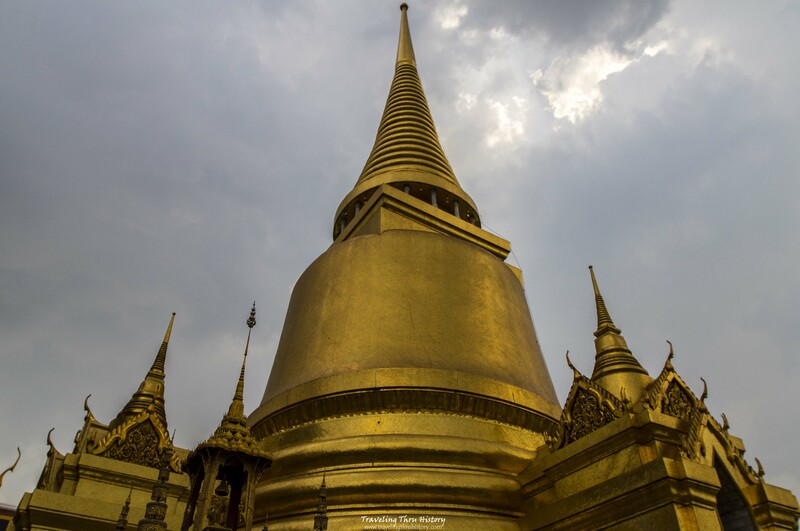 One of the next structures you will come to is the giant golden chedi that dominates the sky. Phra Si Ratana Chedi was built by Rama IV in the mid 19th century. While part of the reason it was built was to balance the layout of the structures on the upper terrace, it was also created to remind the people of the magnificent chedis built in Ayutthaya during the reign of that kingdom. The Phra Si Ratana Chedi has been designed with small mirrored tiles made of gold to make is shinier and more magnificent that other chedis. The reason being that this chedi houses a piece of the Buddha’s breastbone. Beside the chedi is a beautiful building surrounded by pillars. Phra Mondop. This was the first building built on the upper terrace in the Wat Phra Kaew complex. Another building, Ho Phra Monthien Tham had originally stood there, but it burned down during a fireworks display shortly after being built. Rama I had this building put in its place and it houses the revised editions of Buddhist literature. Phra Mondop is modeled after the mondop shrine over the sacred site of The Buddha’s Footprint in the Saraburi province. Phra Mondop is made up of green mirrored tiles inlaid with gold medaillions that depict the Buddha. At the base of the walls are two rows of small golden guardian angels, no two of which are alike. At each of the four corners of the building are stone Buddhas carved in the 9th century Javanese style. Twenty twelve-cornered, glass-inlaid stucco pillars topped with lotus capitals support the intricate seven-tier roof. This building is closed to the public at all times. Click the images to see them bigger and read a little more information about each piece. One of the replica 9th-century Javanese Dhyani Buddhas from Candi Plaosan sitting at each of the four corners of Phra Mondop. The originals are housed in the Museum of the Royal Chapel. Smaller version of one of the Yaksa Tavarnbal (demon guardians) guarding the top of the stairs leading to Phra Mondop. These were created during the reign of Rama I and are regarded as the most perfectly proportioned of all existing classical sculptures of Rattanakosin craftsmanship. Close-up of the roof of Phra Mondop. The embellishment of the roof is done using a form of Chinese broken-pottery artwork called chien-nien. Around the roof of Phra Mondop are multiple mini gables as well as miniature figures that are reminiscent of the Naga, the multi-headed serpent. The serpentine figures on the roof of Phra Mondop are attached to the roof via a bargeboard, which is a long, thin panel on the edge of the roof at the gable ends and are called lamyong. A lamyong is sculpted in an undulating, serpentine shape called nag sadung. The blade-like projection on top of its head is called a bai raka and represents both the naga fins and the feathers of Garuda. The piece projecting from the chin of the lamyong is called a hang hong, which usually takes the form of a naga’s head turned up and facing away from the roof. The naga head may be styled in flame-like kranok motifs and may have multiple heads or it may just be one head. Capitals of Phra Mondop. The seven-tiered roof is supported by twenty glass-inlaid stucco pillars with lotus capitals. One of the many Garuda that line Phra Mondop. In Thai mythology, the Garuda is known as the King of Birds. This Garuda is in the act of tearing a Naga in two, an act that symbolizes the Thai monarchy. This is the Naga, a five-headed snake god from Thai folklore. These creatures protect each stairway leading up to Phra Mondop. Smaller version of one of the Yaksa Tavarnbal (demon guardians) that lines Phra Mondop. This one is in the form of an angel. Beside Phra Mondop is an equally impressive structure. Prasat Phra Thep Bidon, the Royal Pantheon, is the largest building on the upper platform. It was built in 1855 by Rama IV as the original home of the Emerald Buddha, but he died before Prasat Phra Thep Bidon was completed. Rama V did not think it was big enough for a royal congregation, so he built the Temple of the Emerald Buddha instead. To make use of the magnificent structure his predecessor had built, Rama V put a gilt stupa that had belonged to Rama IV inside as homage to the man who had built it. During the reign of Rama IV, the original building burned down, but Rama VI restored the building to its original specifications and placed life-sized statues of all of his predecessors. The tradition has been kept up and there are statues of every Rama of the Chakri Dynasty inside the Royal Pantheon. This building is closed to the public every day except for April 6th, which is Chakri Day. Check out the roof! Isn’t that amazing! Beyond those three structures you’ll find a relica of Angkor Wat. I think this was one of my favorite parts about the visit. Scale model of Angkor Wat. This model was created during the reign of Rama IV, which was also the time when Cambodia was a vassal state of Siam. In order to show off the grandness that was under Siam’s rule and to be able to enjoy the beauty of Angkor Wat without having to leave the palace grounds, Rama IV had this model constructed. As an ironic turn of events, during the rule of Rama V, rule of Cambodia was given over to the French in order for Siam to retain their independence during the French occupation of that region. Behind the replica sits a building that is designed quite different from the rest. 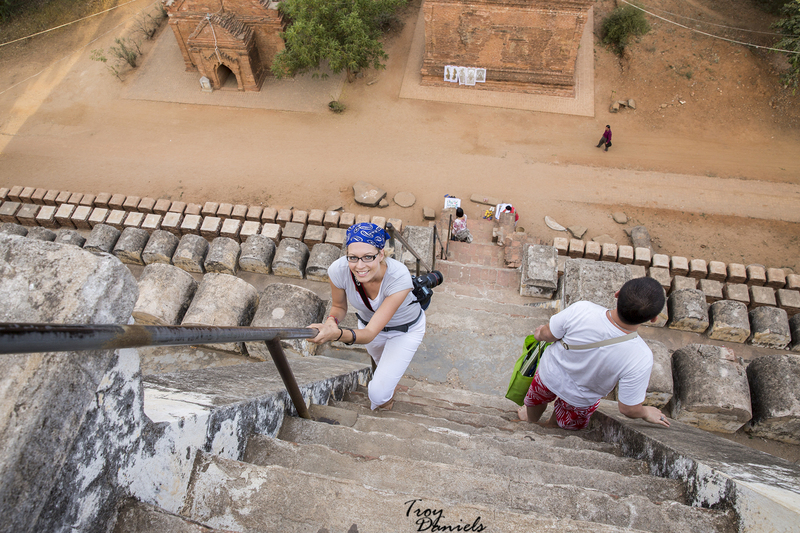 Steps leading down to Phra Sawet Kudakhan Wihan Yot. This building is made of cement embellished with bits of Chinese porcelain. According to the traditions of Thai hramostroitelstva, this building was designed for storing various images of Buddha, the most important of which is the Phra Nak Buddha that was rescued from Ayutthaya during the reign of Rama I. This Buddha is made of gold, silver and copper. Unfortunately, this building is closed to the public, so only the royal family has access to the Buddhas stored therein. Phra Sawet Kudakhan Wihan Yot. This building is made of cement embellished with bits of Chinese porcelain. According to the traditions of Thai hramostroitelstva, this building was designed for storing various images of Buddha, the most important of which is the Phra Nak Buddha that was rescued from Ayutthaya during the reign of Rama I. This Buddha is made of gold, silver and copper. Unfortunately, this building is closed to the public, so only the royal family has access to the Buddhas stored therein. Nok Tantima, or Tantima bird, is one of the guards for Phra Sawet Kudakhan Wihan Yot. Mythical Chinese lion guarding Phra Sawet Kudakhan Wihan Yot. Gable of the Phra Sawet Kudakhan Wihan Yot. This building is made of cement embellished with bits of Chinese porcelain. According to the traditions of Thai hramostroitelstva, this building was designed for storing various images of Buddha, the most important of which is the Phra Nak Buddha that was rescued from Ayutthaya during the reign of Rama I. This Buddha is made of gold, silver and copper. Unfortunately, this building is closed to the public, so only the royal family has access to the Buddhas stored therein. As you walk around the temple complex, you will see many other structures, sculptures and decorative items. Click the images to see them bigger and read a little more information about each piece. Gandhara Buddha Viharn. This chapel was built in the 19th century for the sole purpose of housing the Gandhara Buddha. This Buddha is unlike most Buddhas because he is standing instead of sitting. He also has one hand gesturing to heaven to call down rain while the other hand is cupped to catch the rain. The Gandhara Buddha was very important for royal rain rituals. One of the eight Phra Atsada Maha Chedis that line the east wall of the Wat Phra Kaew complex. In the original complex design, all eight chedis were outside the complex walls, but two are now enclosed by the walls from when the walls had to be extended to allow for the upper terrace the Royal Pantheon sets on to be built within the walls. Each chedi is decorated with different shades of Chinese porcelain and each of the chedis stands for one of the eight elements of the Buddhist religion: Right Understanding, Right Thought, Right Speech, Right Action, Right Livelihood, Right Effort, Right Concentration and Right Mindfulness. One of the two ‘small’ golden chedis behind Prasat Phra Thep Bidon being held up by Yaksa Tavarnbal (demon guardians). These chedis were built by Rama I. One is devoted to his father and the other is devoted to his mother. Ho Phra Monthian Tham. This building was built by the brother of Rama I after the first structure (built by Rama I) on this site burned down. The mother-of-pearl doors were scavenged from Wat Borom Buddharam in Ayutthaya. It houses sacred Buddhists texts and is never open to the public. This is the gable over each gateway between the Temple of the Emerald Buddha complex and the Middle Court. Monetary offering made at the monument to Rama I, II and III. Buddhists believe that offerings made at shrines and monuments can be received by the dead and used in the afterlife. Top of the monument to Rama I, II and III. There are similar shrines around the complex for the subsequent Rama rulers. Base of the monument to Rama I, II and III. The elephants are made of bronze and are in honor of the white elephants that served the kings of Thailand over the years. Before leaving the temple complex, you would be remiss if you didn’t see the actual Temple of the Emerald Buddha itself. Unfortunately, cameras are not allowed inside, but we got a few decent shots from outside. Click the images to see them bigger and read a little more information about each piece. 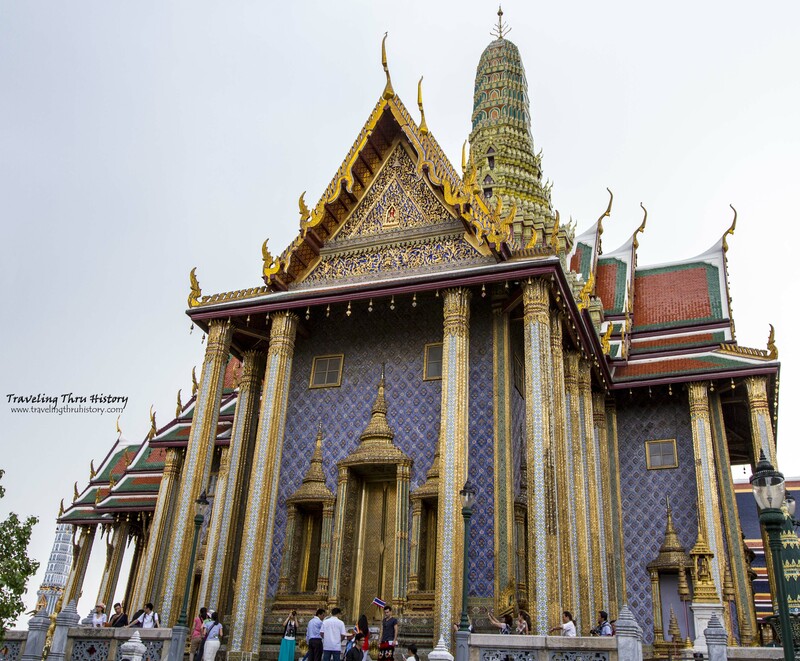 The Emerald Buddha was brought to the Grand Palace when it was completed in 1782 and then moved to the temple when it was finished. There are various legends surrounding the Emerald Buddha with no concrete date as to when it was actually made, though some of the legends place it as being made in India 500 years after Lord Buddha reached nirvana, though nobody knows exactly when that was. Another legend shows it as existing in the lands that are now Cambodia during 457AD. During the proceeding centuries, it changed hands several times before landing in present-day Loas for several hundred years before Rama I became king of what is now Thailand and brought the statue to Wat Phra Kaew. 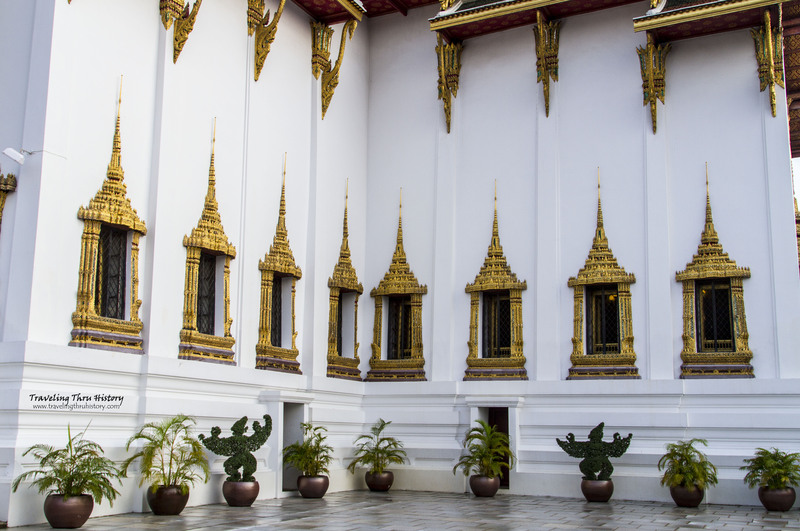 Six ornamental chedi surround the wall that encompasses the Temple of the Emerald Buddha. Three are blue and three are green. This is how tall the lowest section of the Temple of the Emerald Buddha is. The streaks in the picture are from the rain that was coming down. As a side note, the Temple is not actually a temple. By definition, it is a chapel since it does not have living quarters for monks. Were there living quarters for monks, then it would be a Buddhist temple. It is still commonly known as, and called, the Temple of the Emerald Buddha because that is what most people know it as. 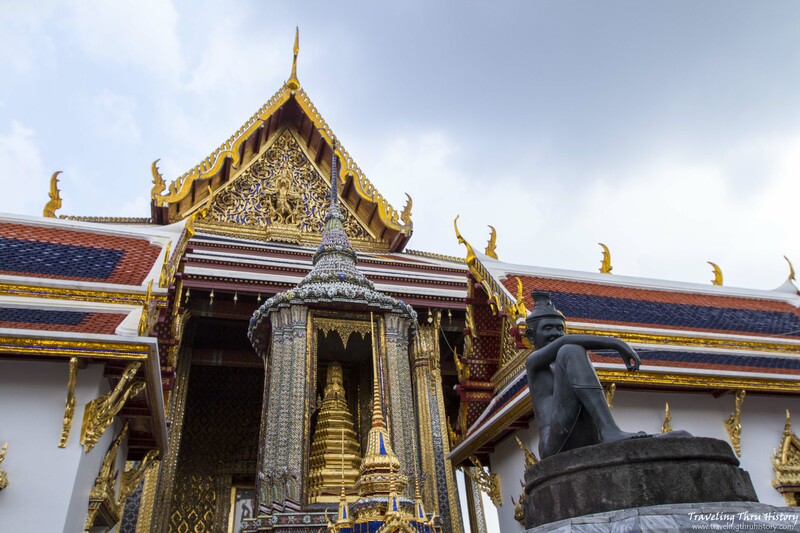 After leaving the temple complex, you’ve finished with the biggest part of the Grand Palace. What’s left are the few buildings you can wander around the exterior of in the Middle Court. Phra Thinang Aphorn Phimok Prasat. This pavilion was built by Rama IV as a place for him to change his formal regalia when entering or leaving the Maha Prasat area. It was also used as a place for the king to mount his palaquin. Behind it is Phra Thinang Chakri Maha Prasat. Phra Thinang Chakri Maha Prasat. This building was built by Rama V in 1882. The original structure was designed by a British man named John Blunich. Rama V had desired a western building, but members of his court became outraged by the dominance of their royal seat by a large western building, so the original dome was removed and a Thai-styled roof was put in its place. Because of the conflicting styles, this building is nicknamed the ‘Westerner with a Thai hat’. Beyond that is a group of buildings that were used as the main residence and audience halls of the kings. It is tradition for each Rama to stay at least one night in the Chakraphat Phiman Hall after their coronation since it was the primary residence for the first three kings of Thailand. Phra Thinang Dusit Maha Prasat is a throne hall that was built during the reign of Rama I and is one of the oldest buildings in the entire palace complex, though it is not the original. The original building on this site was started in 1782 and completed in 1784. That was where Rama I held his formal coronation ceremony. In 1789, though, the building was struck by lightening and burned down. Rama I then had an entirely new building put in its place. Interesting tidbit, because of what happened, Rama I predicted that his dynasty would only last for 150 years. This prediction was recorded in the diary of one of his princesses. Interestingly, 3 months after the 150th anniversary of the Chakri dynasty, the Siamese Revolution of 1932 occurred and absolute monarchy was replaced with a constitutional monarchy. This hall used to be used for coronations, but after the revolution, no coronations have been held there. Though, the tradition of housing the remains of the king, queen and high-ranking members of the royal family for a period of mourning is still observed. Windows on Phra Thinang Dusit Maha Prasat. This throne hall is built in the shape of a tall mountain to represent Mount Meru, the mythological centre of the universe. Price: 400 baht – This price also include a ticket to The Pavilion of Regalia and a ticket for the Vimanmek Mansion Museum, which is offsite and can be used within 7 days. Dress: As for requirements to get into the Grand Palace, the dress code is quite strict. No shorts, tank tops or short skirts. Men must wear pants and a shirt with sleeves. Women must wear a long skirt and a shirt with sleeves. Short sleeves are okay, but sleeveless is not. Women wearing pants will be turned away, but you can rent a sarong outside the entrance if you don’t have one with you. There are people outside the palace who will rent clothing, as well, but be warned, they may run off with your deposit money. That happened to us. NOTE: I’d recommend visiting the Grand Palace first thing in the morning. We arrived around 1pm and it was VERY crowded. I’d recommend arriving in the morning as soon as it opens. Since we got there so late, we kinda had to rush through parts of it so we could see the whole thing. I’d recommend allotting around 3 hours for the Grand Palace. Congratulations! 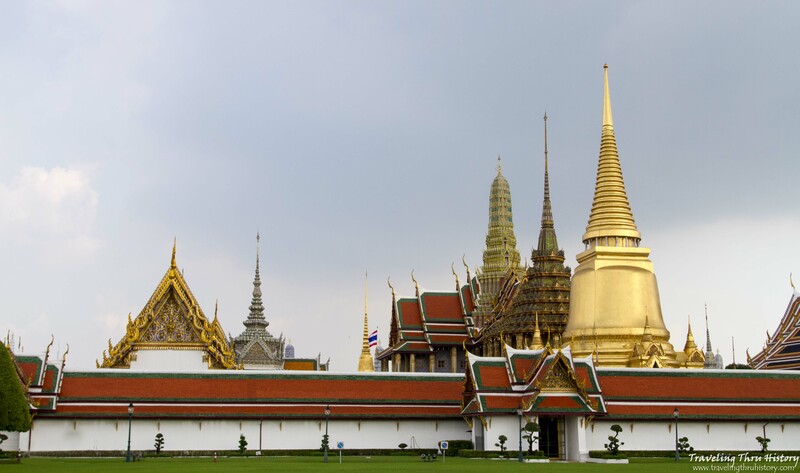 This is the best article I have found about the Grand Palace. Very detailed and with beautiful photos. It has information that I did not find anywhere else. Keep writing! Thank you so much! I’m glad you enjoyed my post and that it was helpful for you! Well there is something to be said about dry, sterile writing. I’ve lived in Thailand since 1991. I have to bring visitors to the palace 2 or 3 times a year. I know the place backwards and forwards but I found your blanketed commentary enjoyable. Are you Canadian or possibly german? I can’t think of any other culture who would write in that style. To answer your question, I’m an American. I’m 32 and a junior-level college student after having been a legal assistant for 4 years, so perhaps I’ve spent too much time typing legal documents writing essays of late. Thank you very much for all the information and fantastic pics. I went to the palace last month and I was so overwhelmed by the beauty of the place. Your website is helping me to re-live that day and learn a lot. Thanks for stopping by and for commenting! I’m glad you enjoyed the Grand Palace and that my post was able to bring back fond memories. We were a bit overwhelmed by it, too. The grounds are just so fascinating and so different from anything we’d ever seen before. I spent an incredible day in the very place several decades ago. It’s wonderful to see that all has been preserved except it looks like there’s more signage. Thanks for the history lesson…and amazing photo tour. Good tip on visiting the temples first thing in the morning to avoid the crowds. I will be headed over to Thailand this April (my 4th trip there). I love the Buddhist culture and Thailand’s people So far, I’ve been to Chiang Mai, Phuket, and Angkor Wat in Cambodia. After seeing your photo’s, I have another temple to visit! Yay! You will LOVE the Grand Palace. It’s such a fascinating place. I’m kinda jealous of you getting to go to Thailand 4 times. We went twice: Bangkok/Ayutthaya/Pattaya and Phuket/Koh Phi Phi. I’ve heard great things about Chiang Mai and hope to get there one day. What did you think about Angkor Wat? That place is AMAZING! I visited the Grand Palace decades ago and its wonderful to see my memories match what still exists. Great post. A grand article for a Grand Palace! Thanks for all the in-depth information. Photos are great too! Im looking forward to visiting. This is a truly beautiful experience! I have always wanted to travel to Thailand and hope to make it one day. It’s on the bucket list! Looks fabulous! The pictures are really awesome. I never visited here before. I am very much interested to know about historical places. Thank you so much for sharing your experience. Oh my gosh- this looks amazing! I really want to travel to wonderful places like this when my kids get a little older. Wow that is an amazing sight. I’ve always wanted to go to Thailand. My fiance has been there, but I never got to go. I would love to see any of these sights. There is so much history and beauty in them all. Awesome post indeed with the history and the pictures which are just gorgeous. Thanks for sharing. Omg what breathtaking photos!!!! This palace would be amazing to see in person!!! Definitely on the bucket list! I’ve been dreaming to go to Thailand. I heard great stuff about the place. I googled it before as to what is it look like, the people, the society and the like. I fell in love with the place. Now, I am more eager and in love with Thailand after seeing your post. Those were just beyond beautiful photos up there. Such a wonderful place. Wow! Your pictures are absolutely unbelievable! I guess that they don’t call it the Grand Palace for nothing. I would love to visit there one day. It looks like a wonderful place to visit. Wow the Grand Palace has some history to it, I never would have known all that. The pictures are absolutely stunning, you really showcased the workmanship that went into the palace. What a stunning palace, there are so many ornate details in the architecture. I hope to visit Thailand some day! Oh my goodness that is such a pretty palace!!! Thailand is one of the places I would love to visit beautiful to see and a rich history! I have always wanted to visit Thailand! It is definitely on my ‘travel bucket list’ and your photos are breath-taking! Thanks for the share! 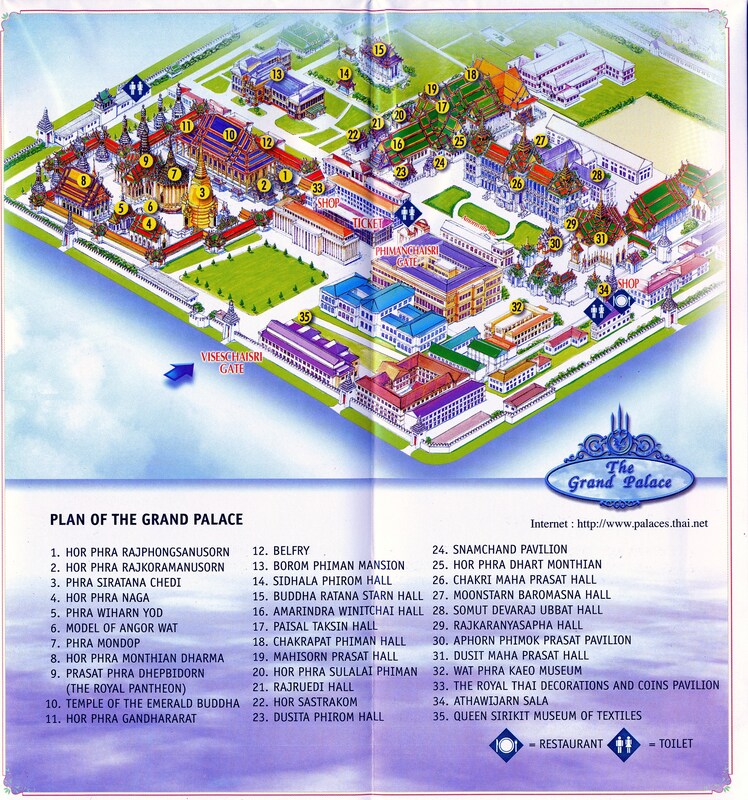 The Grand Palace looks like one of the first places I should visit! Happy Wordless Wednesday and many blessings! It looks beautiful. Interesting to know how Rama I gained his status. Wow, love this place. I remember visiting this place a few years ago. Def a sight to see! Thanks for bringing back the memories! Great site! So much information and photos – each post is like a guided tour. The architecture is quite different. Very intricate too! I have never been to Thailand. Hi Erin! Your photos are beautiful. I am a history teacher. I teach about Medieval Asia. We have that in common. I love history and I totally admire your ability to teach it! If I were brave enough, I’d be a history teacher. I get a lot of anxiety and sometimes have panic attacks when I have to get up in front of people, so I just read a lot and then write about it. My main focus at the moment is SE Asia because I lived there for a year. That culture is just so fascinating. OMG, that is so beautiful! I LOVE Asian architecture like this. It’s so magical and grand! Your pictures are gorgeous! 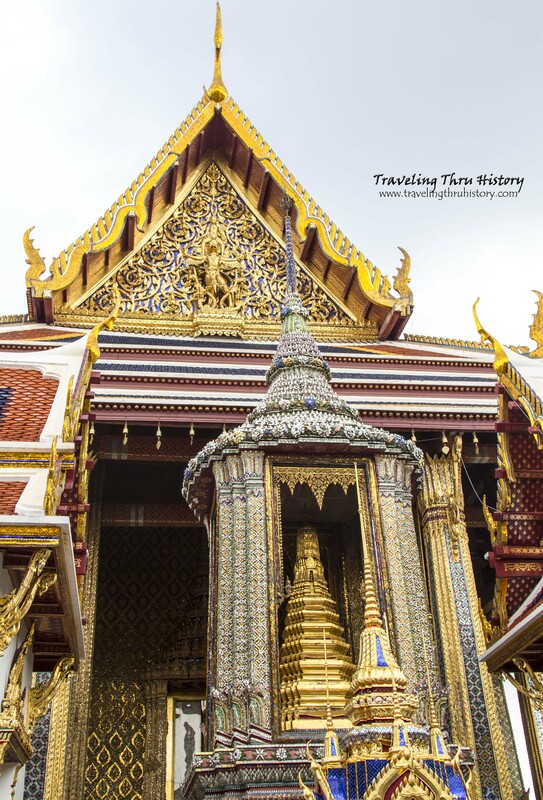 I enjoyed learning about the Grand Palace, it looks like a fascinating place to visit!